First introduced in 1899, with Marianne, the symbol of Liberty, on the obverse and the rooster on the reverse. The 20 French Franc coin has its origins in the changes made to French currency in the late 18th century. Before the Franc there was the Livre (pound), which were made of copper and bore little resemblance to the currency we came to know over the last few hundred years. 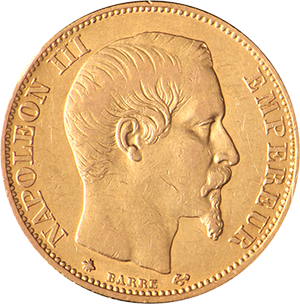 The gold 20 French Franc coin was first introduced in 1803, which depicted the Emperor Napoleon Bonaparte on its obverse. It was also the most valuable of the coins in circulation for its time. In fact, the 20 French Franc became the most iconic coin of its era, being named the “Napoleon” (while royalists named it the “Louis”) from the year 1815 onwards. The traumas of World War One led to the discontinuation of gold and silver coins in France, which, in the present day, has led to such coins being highly sought-after due to their relative scarcity. With rare exceptions, most coins during this era were made from Cupronickel, a mix of copper and nickel. 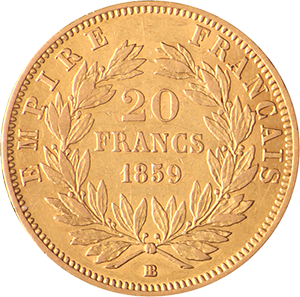 The 20 French Franc coin was one of the purest of gold coinage for the era at 21.6 carats (more than 90% gold). With various designs, one of the most popular for collectors is the one produced in 1899, showing the Marianne, the symbol of liberty, on the coin’s reverse. Other versions of the coin depicted symbols such as the cockerel and the Value in Wreath. It’s gold content measured 0.1867oz and it has a gross weight 6.4516g. All our products are stamped and verified from the relevant authorities and we have built a reputation over multiple decades at the forefront of gold vending in the UK. If you have any questions, we are happy to provide advice for free from our UK office, including information on historic coins, bullion and other precious metal products.